So last night I could hear some rustling around in the garden. Soft thudding footsteps in the darkness. The footsteps slowly came closer. Was it a burglar? Was I about to be whacked on the head with my own shovel by this unknown assailant? No, as suddenly by the door appeared a massive international badger of mystery. WHOA! I was not expecting that. It then continued to shuffle forward as if to walk through the door and I managed to half shut it before he was in the house. 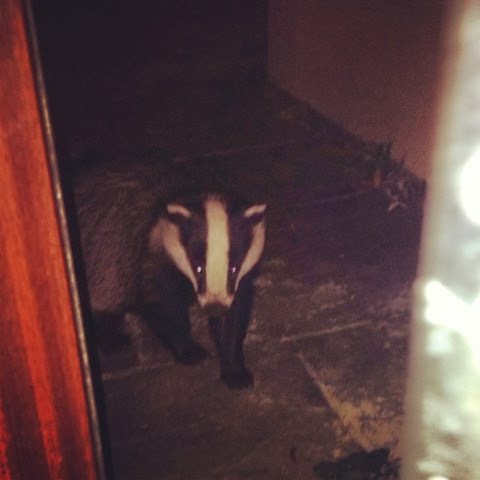 We had a brief chat, and once it was clear that I wasn't interested in buying any double glazing or inviting him in for a cup of tea he sort of shrugged his shoulders and tottered off into the night on his badgerly business. I'm sorry to keep badgering you, but if you enjoyed this please subcribe via Bloglovin or follow me on Twitter! The 2017 US Open is just around the corner. Mexico vs Sweden – Match Stats. Mexico and Sweden have already faced each other on nine occasions but only once at a World Cup. At the 1958 World Cup Sweden beat Mexico 3-0 at the group stage. Thanks very much for the comment. Check out the 'about me' section for a link to my Facebook page. How do you protect your child from the internet? It is hard being a dad, too. Diary Ramble - Men Can't Multi-task! Baby, tap a tune for me. The story of how it all began. The birth story.